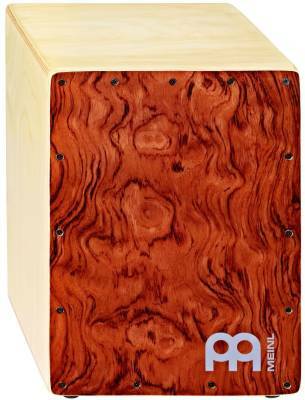 The Meinl Jam Cajon is perfect for playing on the go. Its compact design is lightweight and easy to carry to drum circles, unplugged gigs or wherever you want to enjoy playing. The size makes it ideal to grab for spontaneous jam sessions and has every feature of a standard size MEINL Cajon. Crafted in Europe from birch wood, the Jam Cajon has great low end punch when played near the center and dishes out high frequency slaps when striking the top corners. Two sets of internal fixed snare wires brush against the playing surface to deliver a crisp, sensitive snare effect. The finish lets the beautiful natural wood grain show through, and the birch construction produces a rich sound that goes with any style music.